This medication is used to treat a certain type of sleep problem (insomnia) in adults who have trouble falling back asleep after waking up in the middle of the night. It helps you return to sleep faster so you can get a better night's rest. Zolpidem belongs to a class of drugs called sedative-hypnotics. It acts on your brain to produce a calming effect. This medication should only be taken if you have at least 4 hours of bedtime left. Zolpidem is usually limited to short treatment periods of 1 to 2 weeks or less. Read the Medication Guide and the Instructions for Use provided by your pharmacist before you start taking zolpidem and each time you get a refill. If you have any questions, ask your doctor or pharmacist. If you wake up in the middle of the night and have trouble falling asleep again, take this medication as directed by your doctor, usually only once a night if needed. Only take it if you have at least 4 hours of bedtime left, otherwise you may still be drowsy in the morning. Do not take this medication with alcohol, or if you have had alcohol that day, especially in the evening or before bed. Also do not take this medication with other drugs to help you sleep. Do not remove the medication from the pouch until you are ready to take it. Since zolpidem works quickly, take it while you are in bed. It is best to take it on an empty stomach. Do not take zolpidem with or after a meal because it will not work as quickly. Place the tablet under your tongue and let it break apart completely before swallowing. Do not swallow the tablet whole. The dosage is based on your gender, age, medical condition, response to treatment, and other medications you may be taking. Women are usually prescribed a lower dose because it is removed from the body more slowly than in men. Older adults are usually prescribed a lower dose to decrease the risk of side effects. Do not increase your dose, take it more often, or use it for longer than prescribed. Be sure to tell your doctor and pharmacist about all the products you use (including prescription drugs, nonprescription drugs, and herbal products). What conditions does Intermezzo Tablet, Sublingual treat? This medication may make you sleepy during the day, especially if you do not take it as instructed (see the How to Use section). Tell your doctor or pharmacist if you have daytime drowsiness. Your dose may need to be adjusted. 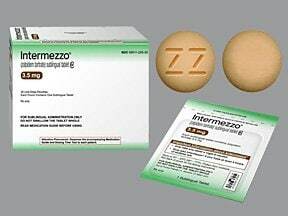 List Intermezzo Tablet, Sublingual side effects by likelihood and severity. Before using this medication, tell your doctor or pharmacist your medical history, especially of: liver disease, mental/mood problems (such as depression, thoughts of suicide), personal or family history of a substance use disorder (such as overuse of or addiction to drugs/alcohol), personal or family history of sleepwalking, lung/breathing problems (such as chronic obstructive pulmonary disease-COPD, sleep apnea), a certain muscle disease (myasthenia gravis). Since this drug makes you drowsy, wait at least 4 hours after taking a dose and until you feel completely awake before doing any activity. This medication may increase the risk of falls. You may also experience dizziness or blurred/double vision. Alcohol or marijuana can make you more dizzy or drowsy. Do not drive, use machinery, or do anything that needs alertness until you can do it safely. Avoid alcoholic beverages. Talk to your doctor if you are using marijuana. What should I know regarding pregnancy, nursing and administering Intermezzo Tablet, Sublingual to children or the elderly? The risk of serious side effects (such as slow/shallow breathing, severe drowsiness/dizziness) may be increased if this medication is taken with other products that may also cause drowsiness or breathing problems. Tell your doctor or pharmacist if you are taking other products such as opioid pain or cough relievers (such as codeine, hydrocodone), alcohol, marijuana, other drugs for sleep or anxiety (such as alprazolam, lorazepam, zopiclone), muscle relaxants (such as carisoprodol, cyclobenzaprine), or antihistamines (such as cetirizine, diphenhydramine). Does Intermezzo Tablet, Sublingual interact with other medications? If someone has overdosed and has serious symptoms such as passing out or trouble breathing, call 911. Otherwise, call a poison control center right away. US residents can call their local poison control center at 1-800-222-1222. Canada residents can call a provincial poison control center. Symptoms of overdose may include: slowed breathing or a deep sleep from which you cannot be awakened. This medicine is a beige, round, tablet imprinted with "ZZ". This medicine is a yellow, round, tablet imprinted with "ZZ". Are you taking Intermezzo Tablet, Sublingual? 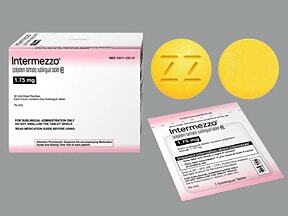 Are you considering switching to Intermezzo Tablet, Sublingual? How long have you been taking Intermezzo Tablet, Sublingual?